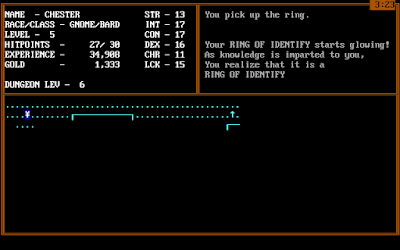 One of the things for which I am most grateful about this blog is that it introduced me to the roguelike sub-genre. The introduction was quite quick, as Rogue was the second game that I played. 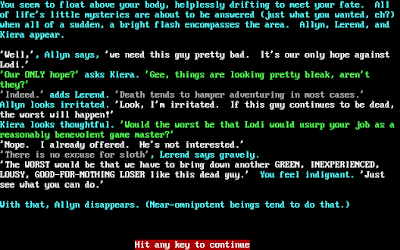 I had never encountered anything like it--had never encountered permadeath at all, really. The idea that you could invest dozens of hours into a character, and then he could be gone, just like that, with one wrong roll of the dice, is a hard concept to grasp when you've grown up playing RPGs that allow liberal saving and reloading. Even recently, when I was playing The Game of Dungeons, I had moments where my mind refused to believe that a character in which I'd heavily invested--hale and powerful only moments ago--was somehow suddenly irretrievable. Because Rogue itself, with its permadeath and dungeon randomization, is so inherently replayable, games in the sub-genre really have to distinguish themselves with new content to be memorable. Otherwise, all you've made is a clone of Rogue. 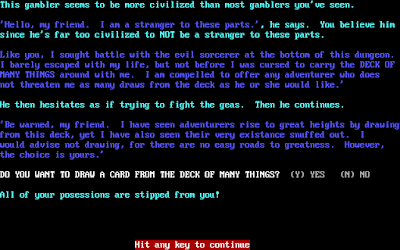 Thus, we find a lot more variance in roguelikes--more than I thought was possible before I experienced them--than we do in many other sub-genres. 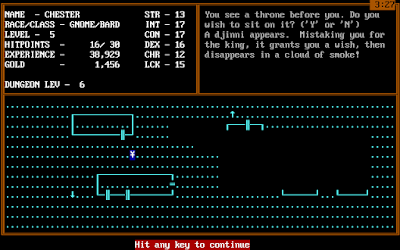 NetHack, UnReal World, Moria, and Wizard's Lair I may look somewhat the same, but they took vastly different approaches in mechanics and content, making them all fun to play in their own way. 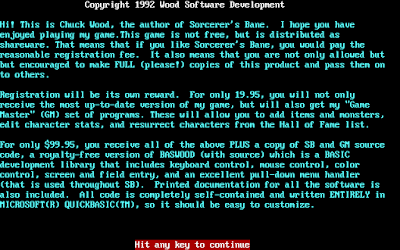 Along those lines, Sorcerer's Bane is an admirable effort from Indianapolis-based developer Chuck Wood. (Wow, is that a difficult name to Google. I'm sure there's at least one "Peter Piper" out there with the same problem.) 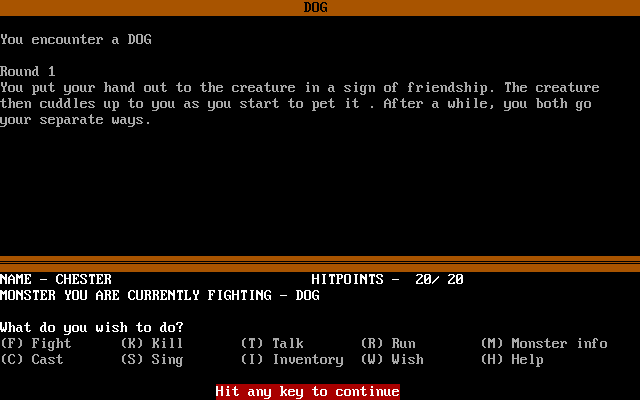 If I've found the right man, he would have been 18 when the game was released as shareware. [Edit: I now think I'm wrong and that the correct Chuck Wood was about 28 in 1992.] He asked $19.95 for it, or $99.95 for a version with the source code. 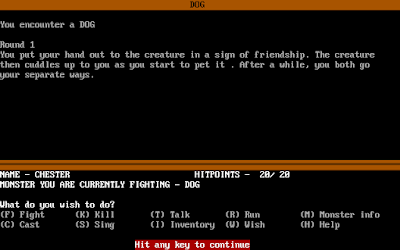 While it has a youth's sense of humor in some of the text, the game is competently-programmed and highly-original. Wood clearly played Rogue (and perhaps NetHack) and was familiar with Dungeons and Dragons conventions, but he wasn't overly restricted by them. Until you register, you have to see this message every time you quit. I'd happily pay the shareware fee, but I can't track Chuck down. The backstory concerns two sorcerers named Lodi and Sabee who together founded a magicians' academy called Mogadore. Each of the wizards wielded a Staff of Power. For some reason, Lodi turned evil and killed Sabee, hoping to use his Staff of Power in conjunction with his own to achieve near-omnipotence. For some reason, Lodi was unable to use the staff, so he broke it into four pieces and hid them in various parts of Mogadore, guarded by four dragons. Lodi then sequestered himself in the lowest levels of the (now-) dungeon to plot further mischief. The player's mission is to reunite the four pieces of the staff, figure out how it works, and destroy Lodi. Character creation has the player roll for strength, intelligence, constitution, dexterity, charisma, and luck on an 8-18 scale. He then chooses from human, elf, troll, dwarf, and gnome races, which further modify the attributes. Classes are fighter, magic user, and bard, and each has unique talents that (unlike the typical roguelike) can't be acquired by the other classes. 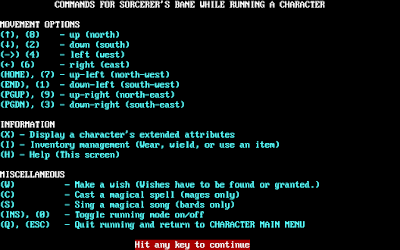 In other words, no one but a magic user will ever cast spells, and no one but a bard will ever sing bard songs. I went with a gnome bard which is a little unusual for me. 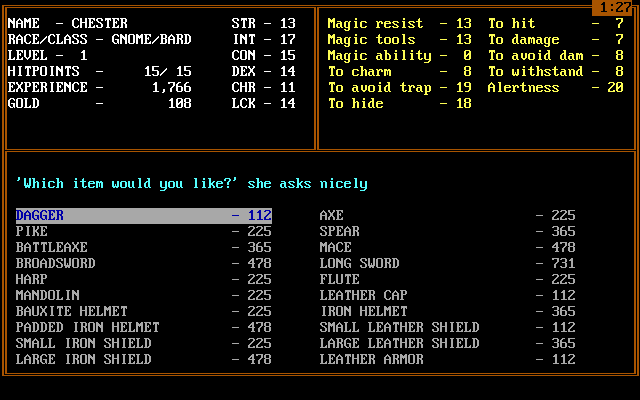 The game begins in a menu town with a single shop and a cleric. You don't have much gold to start, but you can return to the menu level whenever you want. 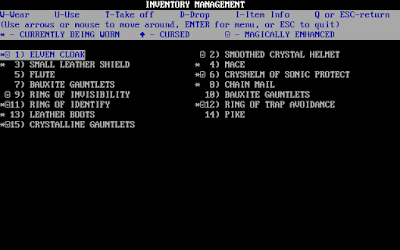 The shop buys and sells weapons and armor, identifies equipment, and recharges wands. The cleric heals, cures sickness, and removes cursed items. Below the menu town, each dungeon level is 12 x 76 squares, with features randomly generated. 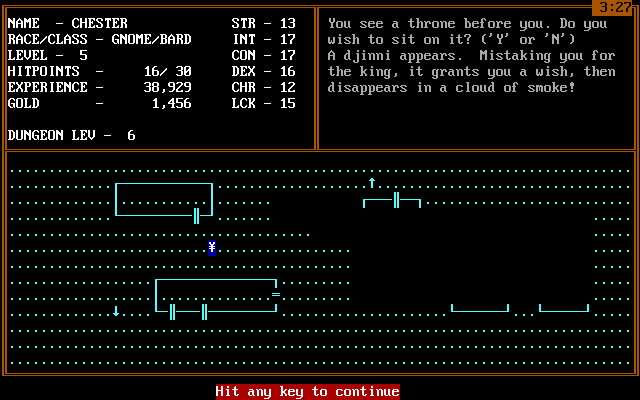 The levels don't have twisting corridors of most roguelikes. Instead, most of the space is open, but with occasional buildings or "rooms." The character is represented by a yen symbol (¥). As you move, you reveal the squares around you, which might contain traps, treasure, or special encounters. Combats appear randomly as you walk, in a separate interface, and monsters are not seen in the environment. My initial reactions to the game were negative, primarily because it has far fewer options than most roguelikes and thus seemed "dumbed down." In the exploration window, there are no regular commands beyond movement and inventory. There's no food system and no complex interaction between items, and no object permanence--when you drop things, they disappear entirely. It has an excellent interface--one of the best I've ever seen in any game. It supports both the mouse and keyboard, and also multiple ways to use the keyboard. For instance, you can arrow among the commands and hit ENTER or type the letter of the command. It anticipates multiple ways that different users might want to accomplish things. 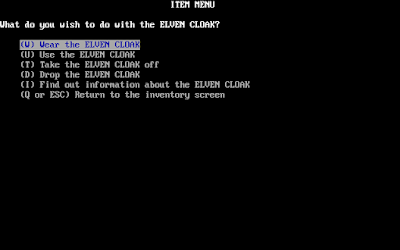 For instance, in the inventory screen, you can choose to (W)ield, (D)rop, or (I)dentify items (among other commands), or you can select the item first and then see a sub-menu of the different things you can do with it. It offers a few shortcuts; in combat, (K)ill causes the entire combat to play out as if you hit (F)ight every round. 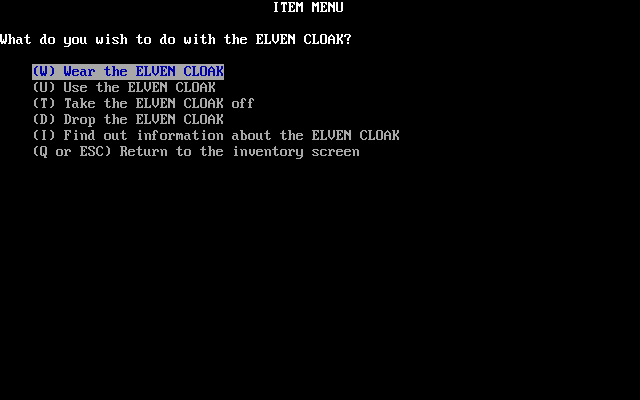 I could have done all these things from the previous inventory screen, or here in a way that's specific to the elven cloak. 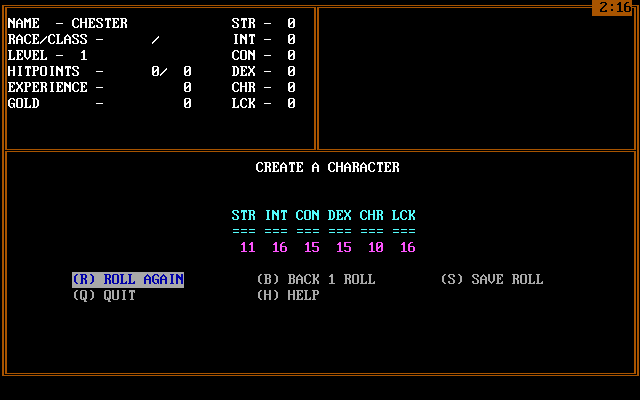 And I can either press the appropriate key, arrow to my selection and hit ENTER, or use the mouse. The "help" system is also excellent. Almost every screen has a (H)elp command that provides contextual assistance with your current situation. Hitting "Help" on the class selection screen brings up a description of each class. You get experience just for walking. Every step grants you one point. This makes it possible to play a "stealth" version of the game, at least at low levels. In combat, you can attempt to avoid battle by simply talking to the enemy. Results depend on charisma, but it works a lot of the time with animals and neutral creatures. 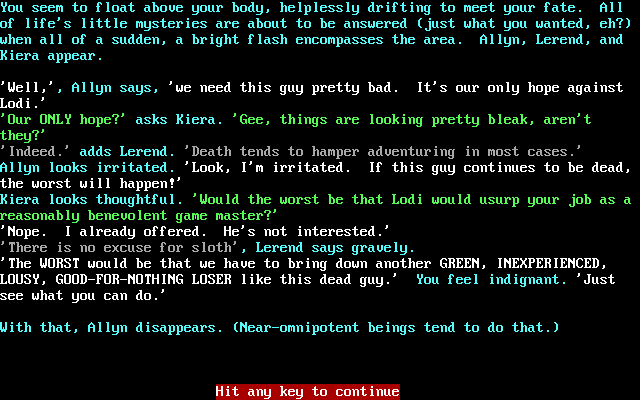 There are even "good" creatures like dryads who have additional encounter options if you talk with them. After you've faced an enemy a few times, you can bring up a "Monster Info" screen the next time you encounter him. 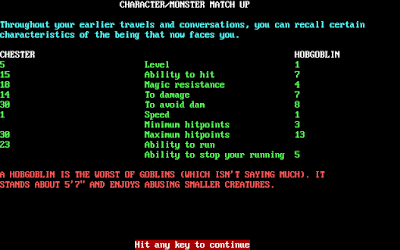 It tells you the monster's statistics (with your own in comparison) and gives you a brief description. Items have fun effects (both advantageous and disadvantageous) that I've not seen in many other games. A "Book of Intense Wealth" gives you thousands of experience points or gold pieces. The cursed "Forward-Only Motion Boots" don't let you use any up ladders. I'm not exactly sure what the "Attacking Floating Sword" does, but it's apparently a good thing. 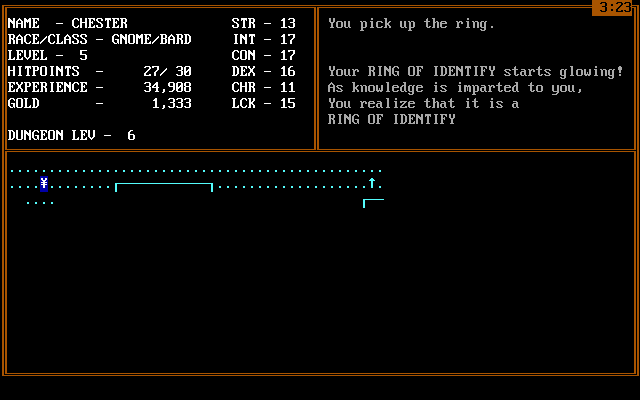 Items otherwise offer the types of resistances and advantages that you're used to in roguelikes, and of course you can keep multiple items to swap in and out of active inventory as the situation demands (e.g., putting on Ring of Disease Resistance when you meet a zombie). There's a complex "wish" system. Various items and creatures can grant you wishes, which accumulate in an associated statistic. 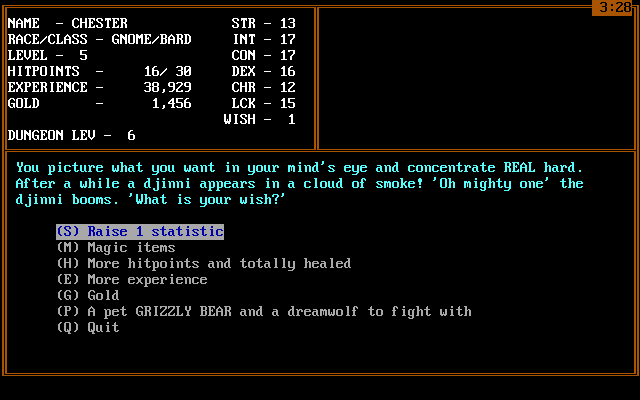 When you want to use a wish, you just hit "W" and a menu comes up offering various options, including raising an attribute, gaining a magic item, healing, extra experience, gold, and "a pet grizzly bear and a dreamwolf to fight with." I haven't tried that last option yet. Some of the wish options. I only have one, so I guess I'd better save it. Monsters include the standard set of roguelike/fantasy creatures. On the first few levels, you might run into jackals, goblins, kobolds, hobgoblins, floating eyes, skeletons, and giant rats. Later, you get more advanced creatures with special attacks and defenses. Were-creatures can only be hit by magic weapons and can cause lycanthropy, for instance. Amorphous acids can corrode items. Mad dogs and zombies can cause disease. Thieves can steal your money pouch and disappear. 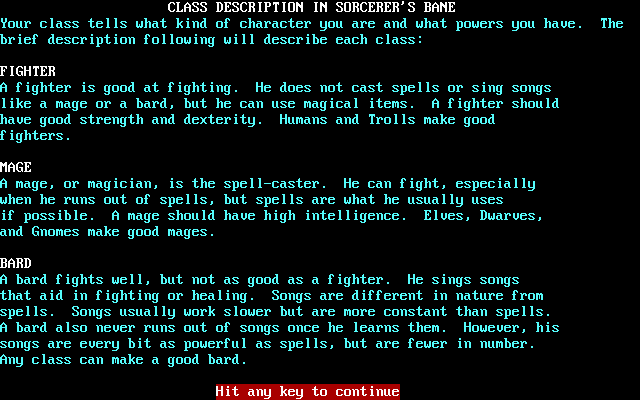 After Level 10, there are spellcasting enemies like satyrs, gorgons, and wizards. I've found it best to run away from a lot of these creature types, especially the animal ones that never offer any gold or items after you kill them. 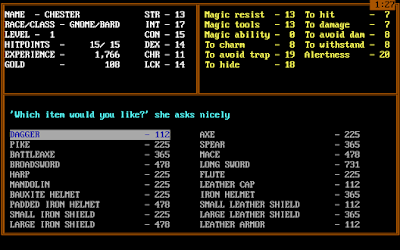 In combat, you have options to attack, talk, run, cast a spell (for magic-users), sing a song (for bards), make a wish, and use an inventory item. A lack of missile weapons and a low variety of items makes combat a bit less tactical than some roguelikes, but it's not bad and at least it's over fast. Health does not regenerate on its own, but in consideration for that, and for permadeath, combat is relatively easy, at least for the first 8 levels or so. A lot of battles end with no hit point loss for the character at all. Running away works most of the time. Every few levels, you find a fountain that usually heals you, and both magic users and clerics have magical healing options. You also occasionally run into wandering clerics. And if you die, the game runs through a humorous scene in which the gods might resurrect you, but at a cost of all your gold (if you don't have much, your chances of resurrection seem to be lower) or some inventory items. I have no idea how many levels the game offers, but I played this first session to dungeon Level 10. 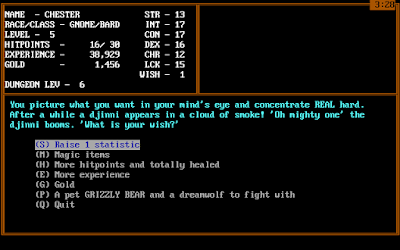 My character rose to Level 6 during the process, which each level increasing maximum hit points and improving a few behind-the-scenes statistics (which you can call up) like "magic resistance," "to hit," and "alertness." Many of my attributes improved from potions, books, and fountains. 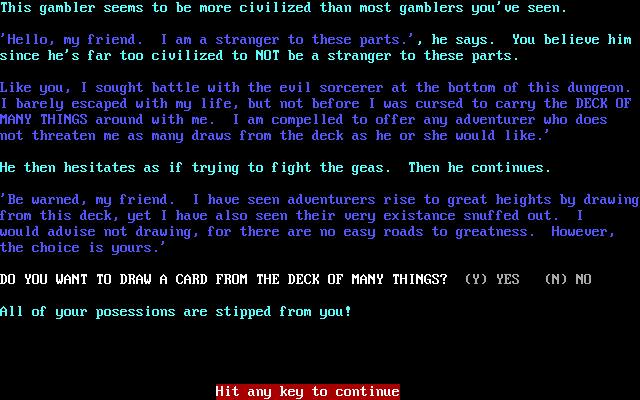 On Levels 9 and 10, the game started to get a bit harder, with tougher enemies like gorgons and wizards, and matters weren't helped by the fact that an unlucky use of the gambler's Deck of Many Things caused me to lose my entire inventory. I've gained two bard songs during the course of the game. "Hypocrita" is a healing song and "Bazerker" is a combat song. Neither seemed to have any effect when I had a regular flute, but once i found a magic "Flying Flute," they both started paying off. In particular, "Hypocrita" heals 6 hit points per move, which means that combats have become about individual difficulty rather than collective difficulty. I expected to find shortcuts to the surface the farther down I explored, but it hasn't happened yet. That means if I want to go back to the shop, I have to climb up 10 dungeon levels. I guess after a certain point, you have to rely on your own resources for item identification and wandering clerics for healing that you can't accomplish yourself. 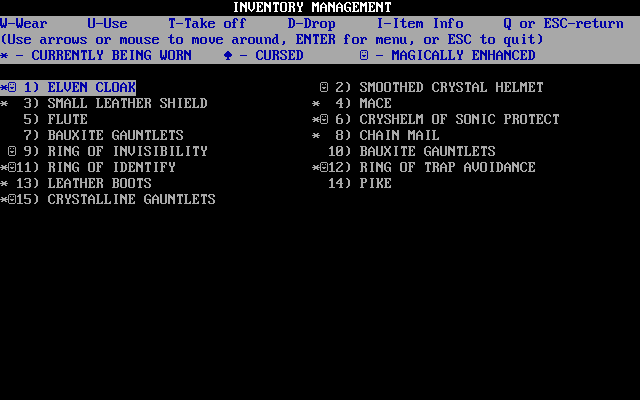 Since I lost all my stuff, though, I guess I'm going to try to make it back to the surface to buy a new set of equipment, then perhaps grind a bit on lower levels until I find a few magic items again (magic items are most common in treasure chests, but monsters occasionally drop them). If I lose this character entirely, I'll probably restart as a magic-user so I can experience that side of the game, but I'll likely backup my character every couple of levels. Sorcerer's Bane will end on a high note if it doesn't last much more than another four or five hours. 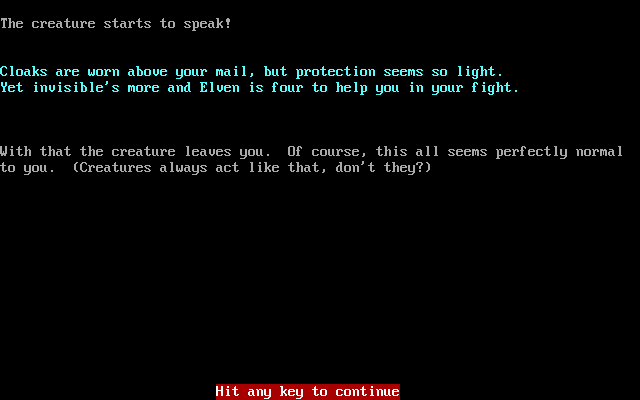 Character development caps at Level 15, which suggests I'm about 40% of the way through, although it concerns me that I haven't found any of the dragons yet. Maybe they're all grouped together on one lower level. For now, the game hasn't made any major mistakes, and I'm impressed that the young developer showed so much innovation and sense of balance. Wow, I can't even imgine how much work went in the controls and helo system. Author was either very competent or VERY hard working. Not to mentiin that he seems to have grasped what makes game a good game. Let's hope he stopped himself from another game wher gameplay takes hundreds of hours just because procedural generating of dungeons makes it easy to create something with billions of levels. Where is ADOM on your list? To make matters worse, the oldest version on the website seems to be 1.1.1 from 2002. Unless the Addict can get an older version direct from Biskup, we'll have to hope that a blog reader has an early version lying around. I would be willing to bet Biskup would give him an older copy if he has it. Its in his interest to have the game written up on here. I'm confused whether this means that the earliest public released version STILL AVAILABLE is from 1996, or whether the earliest public released version PERIOD is from 1996. If so, it's not a 1994 game. You'd have to contact Biskup to be sure, but the archive link suggests that 0.7.0 was the first distributed version (.2.0 is available, but was only distributed to his personal acquaintances and was unwinnable), and the README for 0.7.1 is "copyright 1994,1995,1996". I kinda see it as '94 is alpha, and '96 is public beta, which is effectively 'release'. The earliest mentions online I can find are a release announcement and some other posts in the Usenet newsgroup rec.games.roguelike.misc in March 1996. I recommend posting on the ADOM forums. They are loaded with long time players some of the current developers who work for Biskup post on it. If you say who you are someone (possibly Biskup) will get you a copy. Sorry for the confusion, I got 1994 from a quick google search. 1996 sounds more like the correct time. This looks like a polished, under-appreciated gem. Looking forward to the subsequent posts on this! The Deck of Many Things, LOL. High risk, high reward. Possibility of instant death. Likely to change forever any game into which it appears. Yet another one of Gary Gygax's "he came up with this one day and never bothered to think it through" moments in D&D. 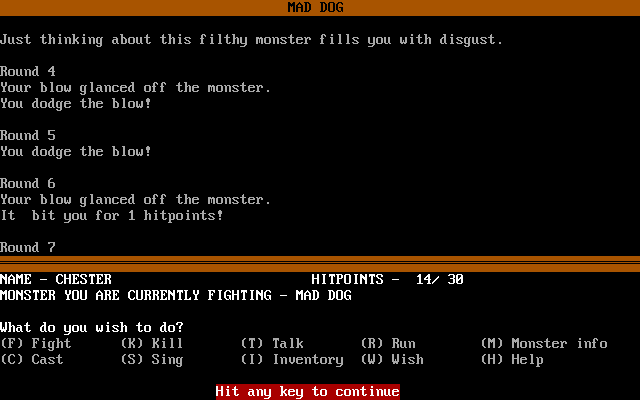 Looks like the game's author wasn't quite up to the task of programming a full roguelike. Random encounters plus separate combat screen means he didn't have to bother with pathfinding and creating an empty field with different sized squares is easier than creating dungeons. But it seems like he knew his limitations and worked with them instead of against them and put in a lot of effort and creativity into other areas. He definitely put more into the interface (help screens, monster memory etc.) than most games of that era. 'One monster at a time' is not super-pure in roguelike terms (as you say, run and gun tactics in a dungeon with multiple enemies is the classic mode), but it's definitely a legitimate option. Looks like a well thought out game. Yeah, I could see where some of the elements simply compensated for lack of programming ability. He compensated well, though. If you can write a GUI framework in BASIC, you shouldn't have much trouble writing a pathfinding algorithm on a fixed grid. Algorithms can be looked up in a book, programming them is usually not that difficult. It's not just "pathfinding," though, is it? I mean, I don't know anything about programming, so I could be wrong, but it seems to me that he would have saved himself a lot of time and effort by not having enemies in the environment at all. Instead, combat is triggered by random probability every time you step in a new square. I feel like *I* could program that, while creating a bunch of independent actors to populate each map and move under their own agency would be beyond my skills, at least. You're right, it saves a lot of time and effort, time that seems to have been invested in other areas. But it doesn't have to do with lack of ability. Monsters are just state - consisting of position, health, type (in a simple case). When the player acts, you go over all the monsters and update their position/state, then repaint the map. You're basically already doing this for the player, so it's really not that big of a step (there's also spawning and stuff, but those are details). Eventually, complexity might become a problem - when you go full nethack style, the number of possible interactions becomes huge. I'm guessing some Moria influence? 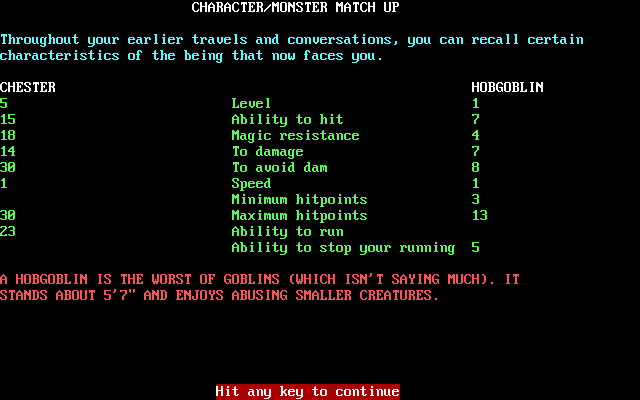 I don't think any other roguelike before this had a monster memory feature. The dungeon levels here also look pretty similar to the Moria town level. The combination of top-down iconographic navigation, random encounters, and modal turn-based menu combat is something that I'm most used to seeing in JRPGs. The roguelike influence is obvious here, but I wonder if the developer had played Dragon Warrior or something along those lines. The "genre" wasn't defined yet, so people just did whatever they felt like. Better that way, honestly. I agree, Harland, that it's better that way. I'd go so far to say that genres don't actually exist except where we choose to believe that they do, and that slavish adherence to the trappings of genre (see Dungeon Master clones, for example) is a bad thing - not just in games, but books, films, anything. You're right that Chuck Wood was around 28 when this was written. I knew him around the time this game was written. He was working with me and a few others on another game project. I remember when he brought "Sorcerer's Bane" over while he was working on it. 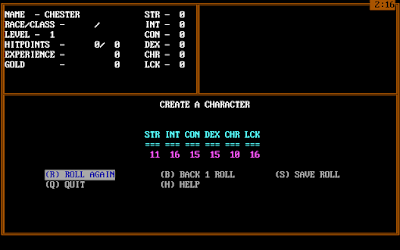 One of the guys in the group scoffed at it, wondering who in the world would like such a game (he clearly had no idea how popular rogue-likes were or would be in the future), but I always thought it was really cool (I wasn't a programmer at that time, but was on the team as the sole computer artist). The project we were working on didn't materialize due to various reasons, but before it all fell apart, I managed to get an early copy of the game from him (which I sadly no longer have) that also had the additional tools that you could purchase that would let you change things in the game. I lost the disk many years ago, but the game was complete even in those early days of 1992. Since then, whenever I see his game pop up on the Internet, I just smile because I actually knew him for a short time. Seeing this review today was quite awesome; because even if you slam his game for various reasons, I can guarantee that he was really passionate about the project and worked on it between taking care of his family and working a full time job during a time when very few people appreciated his efforts. Sadly, I didn't know him well and have no way to contact him in this day and age, but I know someone else who might still have contact with him, and I'll see if I can get any further information or point him toward this review. That's quite a coincidence that you knew him. I wonder if you're any of the individuals found in the acknowledgements--Kent, Larry, Stuart, Mike Bill, Dave, Charles, and Scott. I found three possible e-mail addresses, and only one bounced back, but no response yet from either of the other two (it's only been about 20 hours). I'd appreciate if you could pursue any leads you might have. I’m not one of those people. I didn’t know him well and we only worked together a short time. And while I remember him, primarily because of this game, I don’t even know if he would remember me. He was a coworker and friend of my best friend (whose name is Scott, and could be one of the people mentioned above). I have contacted him to see if he still has contact with him. As a follow-up, I asked my friend and he said that he had lost contact with Chuck a long time ago. He worked with him in the early 1990s, so I knew it was a long shot that he might still be in touch with him. 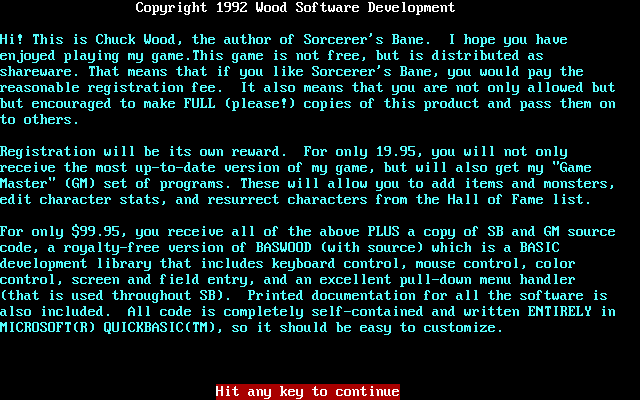 Also as a correction, I realized that when we were working on our project that didn't materialize, it was during the Summer of 1991 (not 1992 as I had previously stated), so the build of Sorcerer's Bane I had was likely not the final version, which makes it even more unfortunate that it was lost some time ago. Anyway, hopefully he will respond to one of your emails. Seems like a really fun-playing game. Been loving the new play-order posts a lot also.